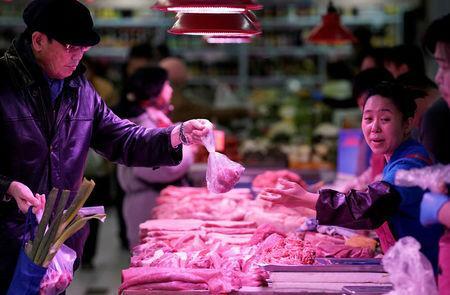 WUZHEN, China (Reuters) - China's imports of pork will increase 'substantially' after the first quarter, following an epidemic of African swine fever that has reduced pig production, a leading analyst said on Thursday. Domestic production of pork by China, which produces about half of the world's total, will fall by up to 20 percent in 2019, said Oscar Tjakra, director, Food & Agribusiness research at Dutch lender Rabobank. China's pig herd declined by 15 percent in 2018, according to the bank's estimates, Tjakra told a conference in Wuzhen.